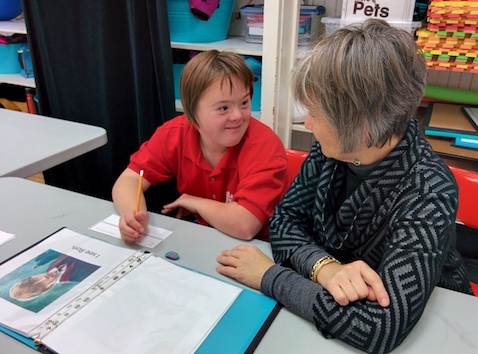 DragonFly ® develops critical skills needed by learners with Down syndrome. Based on international research and best practices, the DragonFly ® programmes instill confidence and independence in movement, reading, math and social interactions. We believe that young people with Down syndrome can be independent, thoughtful contributors to society, capable of setting and achieving their own goals. Point of View Art exhibition by members of DragonFly ® in collaboration with Artist in Residence Beth Ross. Gallery 200, The School of Dance, 2nd Floor, 200 Crichton Street. Meet the artists from DragonFly ® , our programme for learners with Down syndrome. Kate sees herself as a learner: "My brain is thinking." She sees herself as a dancer: "I feel fire in my heart." 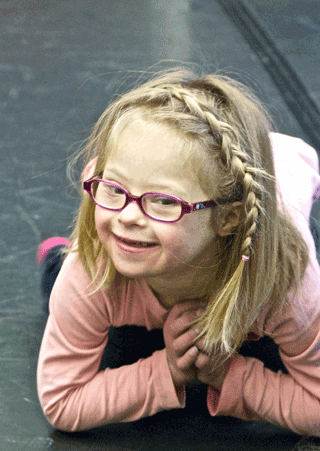 Kate likes who she is: "I'm a Down syndrome kid." DragonFly ® offers 1-2-1 individualized programming! Individualized programmes that focus on basic skills in language and mathematics. Designed to meet the needs of post-secondary young adults, this Programme is also open to students ages 12-21. All Programmes include the foundational components of reading, mathematics and critical thinking skills with dance and movement sections sprinkled throughout the blocks. Barbara Roblin is the Director of Education for DragonFly ® , our programme for learners with Down syndrome. She is a certified Primary/Junior teacher in Ontario with diplomas in Child Study and Early Childhood Education. 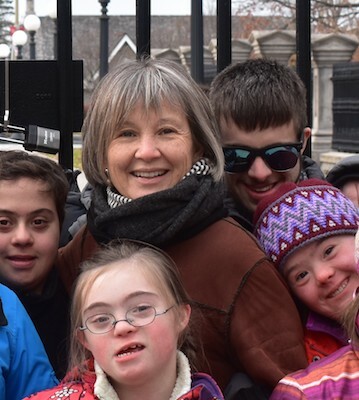 Ms. Roblin has over 10 years of experience working with learners with Down syndrome and has developed the Trio Foundation Program, which creates individualized learning plans in literacy and math for Down syndrome students. 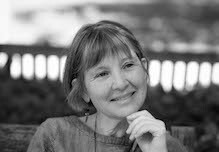 Merrilee Hodgins directs the DragonFly ® dance programmes. Miss Hodgins studied in Canada, England, Denmark and the United States. In 1971, she was awarded the prestigious Solo Seal of the Royal Academy of Dancing. In 1973 she became principal dancer with the Alberta Ballet Company, later working in Denmark, Germany and the U.S. as a freelance artist. Miss Hodgins, a recipient of the YM-YWCA's 1997 Women of Distinction Award, was the 1997 Chair of the City of Ottawa's Cultural Leadership Committee, was a member of the board of directors for Dance Ontario, is a Director of the Celia Franca Foundation, and has been awarded Canada Council grants to research and develop projects to introduce children to dance. 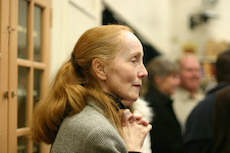 Committed throughout her career to accessibility and collaboration, Miss Hodgins developed The School's portfolio of community programmes including Dance is BEST for Seniors and Dancing in the Street. Recent projects include choreographic commissions from the National Arts Centre Orchestra in Ottawa, collaboration with Canadian poet Susan McMaster, and a commission to produce a concert version of Stravinsky's Firebird for the Brott Music Festival in Hamilton, Ontario. In January 2013, Senator Jim Munson nominated and then presented Merrilee with a Queen Elizabeth II Diamond Jubilee Medal for her work in arts education in Canada. In 2017, Merrilee was presented with the Senate of Canada Sesquicentennial Medal in recognition of her valuable service to the nation. The School of Dance thanks the Ontario Trillium Foundation for their support of our magical programme. Copyright © MCMV - MMXIX Richard J. Worsfold. All rights reserved.